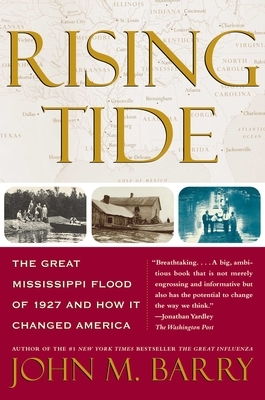 Rising Tide: The Great Mississippi Flood of 1927 and How It Changed America (Paperback) | Turnrow Book Co.
A New York Times Notable Book of the Year, winner of the Southern Book Critics Circle Award and the Lillian Smith Award. John M. Barry is the author of The Ambition and the Power: A True Story of Washington, and co-author of The Transformed Cell, which has been published in twelve languages. As Washington editor of Dunn's Review, he covered national politics, and he has also written for The New York Times Magazine, Esquire, Newsweek, The Washington Post, and Sports Illustrated. He lives in New Orleans and Washington, D.C.
Jim Squires Los Angeles Times An important contribution to history and literature. Tom Wicker This is the kind of history I love -- the brilliantly told story of the great Mississippi flood of 1927, a disaster for millions but the making of a future president and a turning point for the nation. T.H. Watkins The New York Times Book Review Extraordinary...Rising Tide stands not only as a powerful story of disaster but as an accomplished and important social history, magisterial in its scope and fiercely dedicated to unearthing truth.